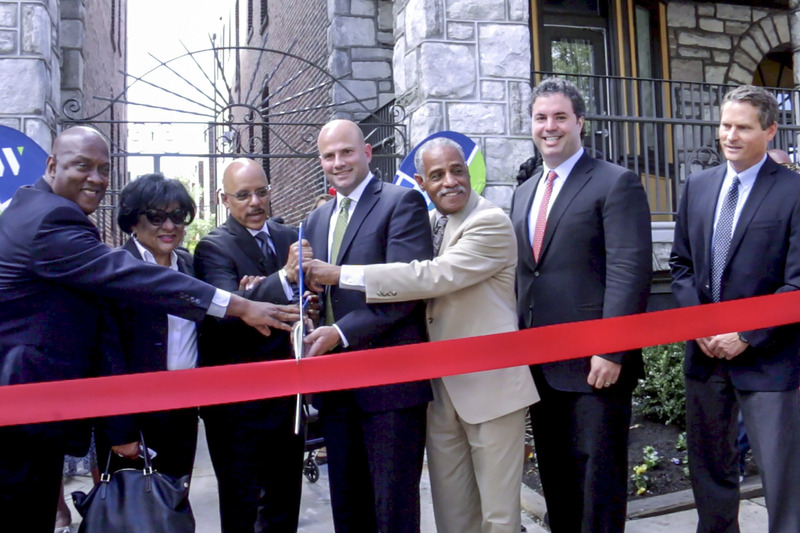 Philadelphia, PA (September 23, 2016) WinnDevelopment, the development arm of award-winning multifamily housing company WinnCompanies, today celebrated the completion of a $14.7 million rehabilitation of Breslyn House in Philadelphia, protecting affordable housing in the city's rapidly gentrifying Walnut Hill neighborhood. State and local officials, along with Breslyn House residents and community leaders, gathered at the 60-unit property to mark the end of the extensive renovation work, which was fueled by a public-private refinancing agreement that also preserves the community as federal Project-Based Section 8 Housing until the year 2034. As the owners of Breslyn House, we are proud to invest in this community's future as badly needed affordable apartments in a fast-changing neighborhood, said Gilbert Winn, CEO of WinnCompanies. This project is another example of our commitment to maintaining the highest possible quality subsidized housing in urban communities. Purchased by WinnCompanies founder Arthur Winn in 1983, Breslyn House consists of 48 two-bedroom units and 12 three-bedroom units. There are 30 units set aside for families and individuals whose household income does not exceed 50% of Area Median Income (AMI) and 30 units set aside for residents below 60% AMI. The renovation effort included energy efficiency and environmental improvements, building exterior restoration, and enhancement of community spaces, including a new ADA-compliant community room and expanded laundry facilities. Each apartment underwent kitchen and bathroom overhauls, including the installation of new cabinetry, appliances, and fixtures. In addition, three apartments have been made ADA-accessible. WinnDevelopment's investment in the revitalization of Breslyn House Apartments represents a vote of confidence in our diverse and vibrant community, said Pennsylvania State Sen. Vincent J. Hughes. The Walnut Hill neighborhood has seen a good deal of investment over the past few years, and we're grateful to companies like WinnDevelopment for ensuring that we have housing solutions for our most vulnerable residents. Philadelphia City Councilor Jannie Blackwell said: We in Philadelphia's 3rd District are grateful to WinnDevelopment for making our neighborhood safer, greener, and more beautiful with the redevelopment of Breslyn House. The addition of the ADA-accessible units is an important step in ensuring that all Philadelphians, including those with disabilities, can find quality housing. Financing for the project was made possible by the U.S. Department of Housing and Urban Development (HUD); the Pennsylvania Housing Finance Agency (PHFA), through tax-exempt bonds and the allocation of Low-Income Housing Tax Credits; as well as Bank of America and Citi Community Capital. Located in the western part of Philadelphia adjacent to the University City area, Breslyn House was constructed as apartments in 1913 and consists of five, three-story brick and granite buildings with Beaux Arts architectural elements. WinnCompanies converted the property into affordable housing after purchasing it 33 years ago. The Architectural Team served as the project's architect and Domus Construction served as the general contractor for the rehabilitation. WinnResidential, the company's property management arm, manages all of those properties, as well as two other Pennsylvania housing communities, totaling 595 units: Governors Square, 291 units in Harrisburg, and Foxwood Manor Apartments, 304 units in Levittown. WinnDevelopment will begin work later this year on a similar rehabilitation project at the E.B. McNitt Apartments, a 101-unit age-restricted affordable housing community in New Brighton. From L to R: Pennsylvania State Representative Dwight Evans, Philadelphia City Councilor Jannie Blackwell, Pennsylvania State Senator Vincent Hughes, Brett Meringoff, Senior Vice President of WinnDevelopment, Horace Patterson, President of the Walnut Hill Community Association, Gilbert Winn, CEO of WinnCompanies, and Dave Doray, Senior Development Officer of the Pennsylvania Housing Finance Authority.